Upfull is a granola maker with a unique product. They are now ready to scale up and you can support them here. Paid back in full on 4 Apr 18 1 day early!!! 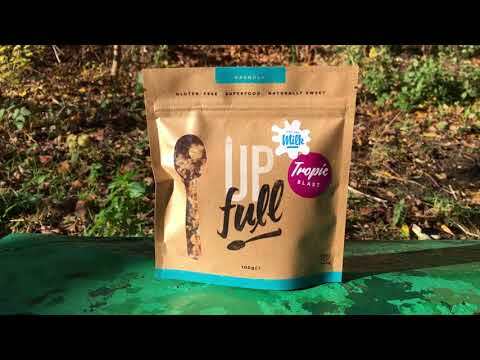 Upfull Food is the only producer in the UK offering a full meal of granola "on the go". Their delicious granola is packed in single-serve, waterproof and resealable bags. The company launched in January this year and is now selling into 79 outlets across the UK in Birmingham, Oxford, London and Brighton. They are now ready to start selling to larger distributors and directly into gyms. Upfull would like you to fund the production of their bags at a cost of £6,450. In return the company is offering repayment plus 5.6% profit in 4 months. Upfull Food successfully raised £6,450 to fund the production of 8,600 bags 504 days ago. Check back soon for more offers. Terence Lapidus was inspired to create Upfull while he was living on the UK's largest live-aboard ship in 2012. On the ship Terence met ex-Gordon Ramsay chef Paul Cromie. Together they filled the ship with the sweet smell of toasted granola and made enough granola to feed the whole community for months to come. Paul Cromie is now Head of Operations at Upfull Food. In true community spirit the Regents Park Boating Community have access to a treasure chest of granola outside the boat where Terence currently floats. Upfull would like to order 21,500 bags from a manufacturer in China. The £6,450 raised will cover all flavours of the product: Cacao Crunch, Nutty Mix-Up and Tropic Blast with accompanying stickers, including shipping and duties. Upfull has the granola to fill the bags and the company's production capacity is 5,000 bags per week. Next year the expected sales are over £6k/mo from bags of granola alone and 2 new products are launching. Terence expects to be able to repay the loan within three months. Upfull's B2B target is to sell multiple pallets in the first quarter of year, starting with Essential Coop and Virgin Active Gyms. Upfull is in discussions with several international distributors across Scandinavia too who are awaiting the Organic certification in January. Upfull is also launching B2C sales in February with the launch of the company's e-commerce website.